Why Choose St. Hugo of the Hills Catholic School? The philosophy of the computer curriculum is that a computer is a tool, not a class. Technology should be an everyday part of every student’s life. Just as students are taught to use a compass and protractor in math or dictionaries in English, they must also be taught the capabilities of computer applications. Every student with access to these tools should be taught to use them to their full potential. When possible, work in the computer lab complements and supports classroom instruction. Computer lab activities align with technology standards and include keyboarding practice. Grades K-2: Pre-keyboarding skills are introduced. 3rd Grade: Formal touch keyboarding instruction begins. 4th through 8th grades: Students will demonstrate correct keyboarding technique while increasing speed and maintaining accuracy. Computer lab activities align with ISTE technology standards and include keyboarding practice. Students are given a Google Drive account (no email accessibility) in 6th-grade computer class. They are instructed on many features of Google Drive that they will use throughout 8th grade. What is Google Drive? it’s a cloud-based program that allows users to store files in the cloud, synchronize files across devices or from anywhere, and share files. … Google Drive encompasses Google Docs, Sheets and Slides, an office suite that permits collaborative editing of documents, spreadsheets, presentations, drawings, forms, and more. 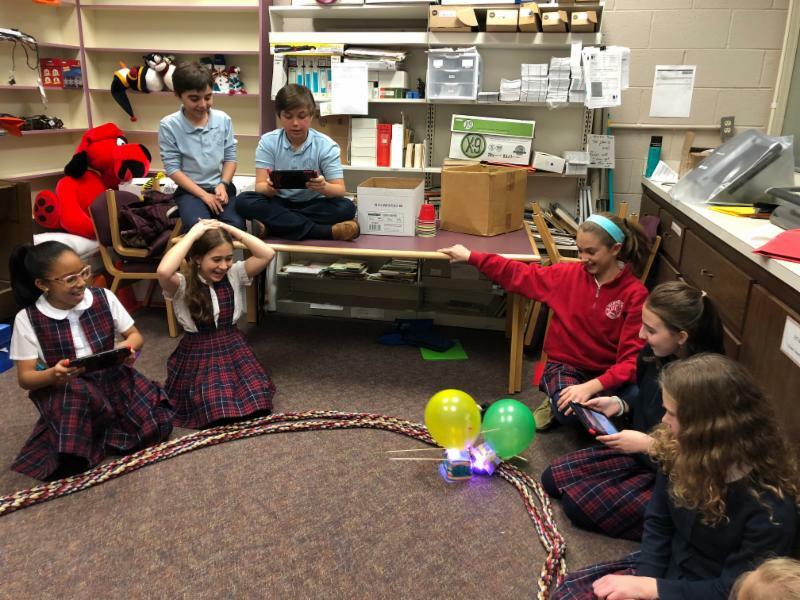 Students in 4th & 5th grades are introduced to programming by starting off with intuitive visual language (symbols) then into drag and drop blocks (block coding). In the upper grades, the focus shifts to more advanced projects incorporating Internet research. These include Microsoft Office, Google Apps, Coding, photo editing, design and cross-curricular research projects. Finally, a key objective is to provide students with the digital literacy and critical thinking skills through project-based learning that include aspects of STEM that is required to become “information consumers” in the 21st century who continually evaluate content on the Internet. 7th and 8th graders have the option of choosing “Yearbook” as an elective. Students are responsible for the creation of the St. Hugo School Yearbook using technology software, taking and editing pictures, and designing pages! Lego Robotics: Lego Robotics students meet twice a week, in class the students use STEM skills through coding to program their robot to complete the week’s challenge. In robotics students use their independent problem-solving skills to complete the task at hand either through collaboration with another student or independently. Microsoft Suite of products developed by Microsoft that includes Microsoft Word, Excel, Access, Publisher, PowerPoint, and Outlook. Each program serves a different purpose and is compatible with other programs included in the package. Students receive instruction using the Microsoft products starting in first grade.